I won the products in this post in a giveaway. All opinions are my own. Happy Valentine's Day! I hope everyone had a lovely day, with or without an S.O.! I recently won three polishes in a giveaway from Alter Ego Nail Enamel, and I decided to swatch 'em all! The theme of this indie brand is that every polish is named after a job or some other identity (hence the name of the company). I think that's really clever! I won Sun Goddess, Vintner and Girly Girl. All of these polishes dried very quickly to a matte finish, so you could wear them without topcoat if you prefer. The brushes are on the wider side and a little too floppy for my taste; I didn't feel I had enough control over the polish at all times. Sun Goddess is a bright warm yellow jelly with red and orange microglitter and small orange hexes. Look how cheery it is! Alter Ego Nail Enamel Sun Goddess. Two coats with Out the Door and Gelous topcoat. I love this shade of yellow! As you can see, at two coats this polish is still sheer. The formula was thick but easy to spread; my only trouble was in getting enough of the larger hexes on my nail. The dabbing method would definitely come in handy here. It was also pretty bumpy--I ended up using three layers of topcoat to get it smooth enough for my liking. Next up is my favorite of the three, Vintner (it's purple, of course I love it!). This is a mix of several shades of purple glitter: magenta, lavender, and dark purple. There are also some green hexes thrown in, which make me think of grapevines! It's definitely an aptly-named polish! My camera, as usual, freaked out at purple and eliminated some of the variety of colors in the mix, but I hope you'll get a decent idea anyway. I layered this polish over L'Oreal Safari Chic. 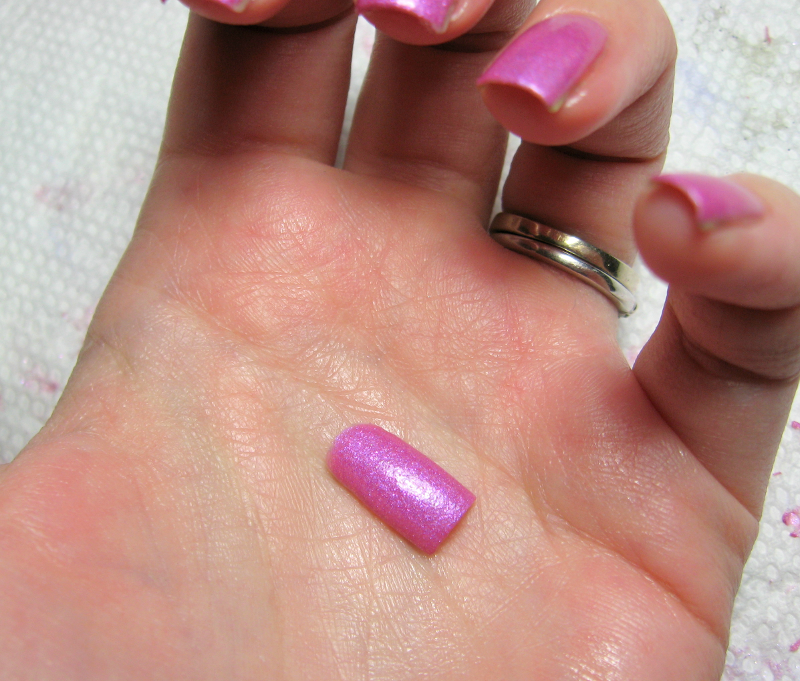 The first photo is with glossy topcoat and the second is matte. Alter Ego Nail Enamel Vintner. Two coats over L'Oreal Safari Chic. Out the Door topcoat. Alter Ego Nail Enamel Vintner. Two coats over L'Oreal Safari Chic. Revlon matte topcoat. Can you tell why I love this one? It's like a grape explosion! I just wish there was a little more green glitter, because it makes such a nice accent to the rest. I had no problems with the formula; I just needed to shake the bottle before use to get the glitters distributed. This one actually dried a lot smoother than Sun Goddess, and I only needed one layer of topcoat. Alter Ego Nail Enamel Girly Girl. Two coats with Out the Door topcoat. Now, this is a very pretty polish (and perfect for Valentine's Day! ), which is why it's so unfortunate that the formula was problematic. I found it to be lumpy and sticky, and it was very hard to spread evenly. I added a ton of polish thinner, which didn't help much. This also required two layers of topcoat to make smooth. To make matters worse, after about three hours the polish started popping off my nails! 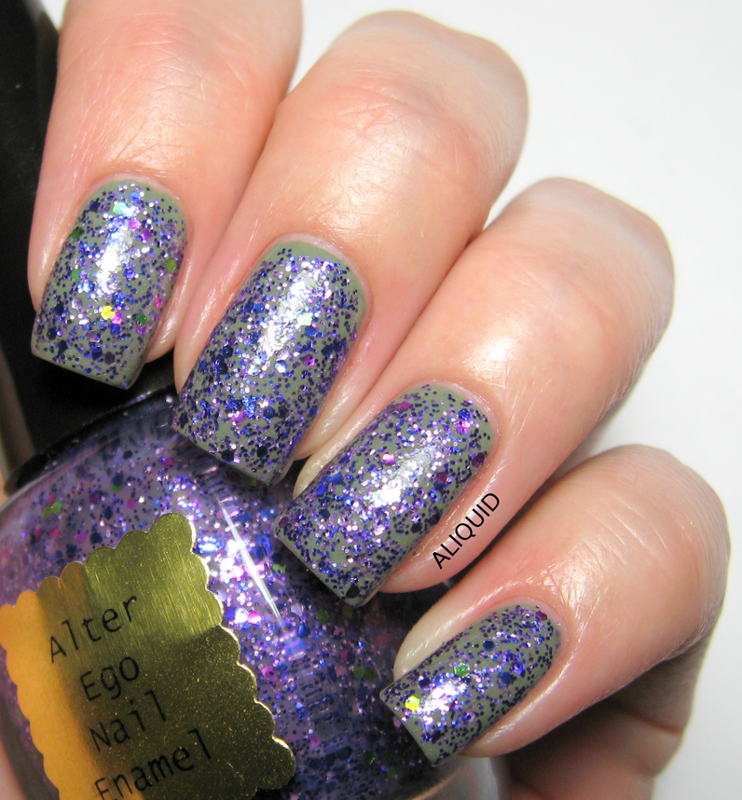 My top pick of these three is definitely Vintner--if you love purple you'll like this polish! All three are available at Alter Ego's shop ($8.50 for 15 ml). You can also follow the brand on Facebook! What pretty colors! I'm in love with Vintner! I love Sun Goddess' mix of red glitter and yellow jelly. A sun dress for your nails, too cute. And Girly Girl? Six fingers!? My word. Thank you for your thorough & honest review! I am so sorry for the trouble with girly girl, this is the first issue I have heard with it, I will send you another one so we can see if it is a continuing issue :) Your photos are wonderful & your manis are perfect!